"I've always worked with tools, loved to travel and wanted to do different things. 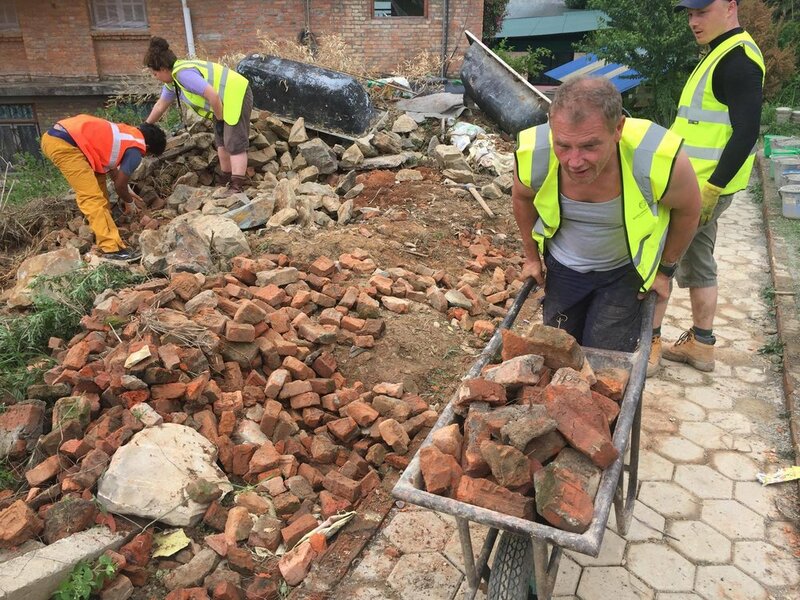 So when, out of the blue a friend of mine said he knew someone looking for someone with building experience to join a team of volunteers, and go to Nepal to build a classroom for the schoolchildren there, I jumped at the chance. After managing to fundraise sufficient funds and having studied books on the innovative method of Earthbag building, I found myself at Heathrow airport ready to meet a group of likeminded strangers. We immediately bonded and i was made to feel welcome from the start. On arrival in Nepal I was made aware of just how bad the devastation was after the horrific earthquakes. The ruins, the dust, the almost post apocalyptic street scenes. But most of all the people. These wonderful people who ask for nothing yet will work hard alongside you and are willing to learn from you, and become your friends." What are youR strongest memories? "After a day of settling in, sorting personal admin and acclimatizing, we hiked up the mountain with a lorry load of materials in tow and found the school we would be helping. I say school, more a collection of temporary outbuildings and ruined blocks of classrooms. The children welcomed us as did the elders and the teachers and we set about discussing location of building, what was needed and where etc. During the first day we set out lines and began digging the foundations while others filled sacks with earth and others got sacks ready for laying. Laying that first sack in the trench was such a wonderful memory as we knew we had begun to make a difference. Over the next few days everyone worked hard to get the walls of the classroom up and finally get the roof on. During these hard long dusty days, great friendships were made and wonderful camaraderie was felt by everyone. We shared frustrations and ideas for solutions. We laughed, we joked, we had fun. But all through this was a determination to finish the job and give the children what they so deserved; a safe, clean and happy classroom where they could prosper and shine. On the last day before heading back down the mountain and eventually heading home, the locals and the children put on a wonderful feast for us. The children paraded round us and sung us songs. Everyone danced and shared in the celebrations. I will always remember stood there in a line with the other guys, holding back tears as the children honoured us with garlands and sang songs for us. It is something I shall always treasure. We left the mountain with mixed emotions, knowing what we had achieved. It had been an amazing adventure with an incredible group of people, who I am now lucky to call my friends." how have youR experiences with worldwide action affected you? "What did I get out of it? I could say pleasure, success, satisfaction, pride etc etc but it's more than all of those things. It's something that you can't describe yet you know the others feel it too. Since the Nepal trip I have been lucky enough to go to Uganda where we built a large 8m x 6m classroom for the children of Kakira Primary school. Also I have been back to Nepal and built a double classroom for the Tri-Ratna school in Bungmati, despite early monsoon rains one minute the ninety degree sun and heat the next! If you are reading this and thinking, could I? Should I? Why would I? I urge you to follow your curiosity and take that first step, and get in touch with Worldwide Action and get involved. I promise you, you won't regret. Good luck and I look forward to meeting you on a project somewhere!